Angel lyrics will inspire you and lift your spirit. That’s the power of angelic inspiration. Indeed, angels have inspired many artists and musicians. And the angel song lyrics presented here are one example. 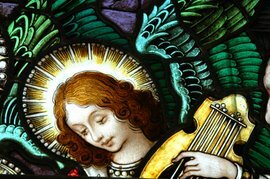 Interestingly, angel music is not limited to traditional religious music or Christmas carols. Many modern angel-themed songs are (or were) performed by pop, country music, and rock singers. From Frank Sinatra to Ella Fitzgerald, and from Martina McBride to Taylor Swift, many singers have sung angel songs. Sometimes artists praise the virtues of heavenly angels, other times they lament the shortcomings of earthly angels. Some songs are filled with gratitude, others express regret; some are happy, and some are sad. But most of these songs are filled with hope. Are you ready for some angel songs? Great! Below you will find several "angelic" tunes. Click on each link to learn more about each song and watch videos of them. The following angel tunes have the word angel in their titles or have been inspired by God’s messengers. Angel Eyes - There are several songs entitled Angel Eyes. Performers include: Frank Sinatra and The Jeff Healy Band. Angel of Music - This is a well-known show tune from the musical The Phantom of the Opera by Andrew Lloyd Webber. Concrete Angel - A beautiful song about a sad reality performed by Martina McBride. "Guardian Angel" songs - Guardian angels have inspired many a song, including Your Guardian Angel by Red Jumpsuit Apparatus. Lips of an Angel - A song filled with angst, it is performed by Hinder. Natasha Bedingfield's Angel - Another song inspired by angels. Sarah McLachlan's Angel - Find here a video and information about this hauntingly beautiful song. --Lyrics (singular -lyric) refer to the words of a song. --Lyric comes from the Greek word lyrikos, which means "singing to the lyre". --The lyre is a musical instrument of ancient Greece. Do you have a favorite angel lyric but it's not listed here? Keep checking back as I'll keep adding new songs.